There seems to be another version of this floating around. I'm guessing the one posted by Ryan is the latest because if you read the paragraph on the bottom, the one above seems to go someway to rectify the reasons for the the refusal of a permit. 1. The proposal by virtue of its height, lack of setbacks and projections will have an overbearing impact upon the public realm, contrary to the relevant provisions of the Melbourne Planning Scheme, including Clauses 21.05, 21.08 and 22.01. 2. The proposal by virtue of its lack of setbacks will have an adverse impact on the development potential of adjoining land and is contrary to the relevant provisions of the Melbourne Planning Scheme, including Clauses 21.05, 21.08 and 22.01. 3. The proposal would result in an inadequate level of amenity for future occupants given the over-reliance on borrowed light and ventilation for habitable rooms. This one will now be known as 'The Carlson' - suppose marketing won't be too far away. 'The Carlson' A couple more renders: The Carlson Posted on 18 April 2013 Melbourne has seen significant expansion and development over the past few years. 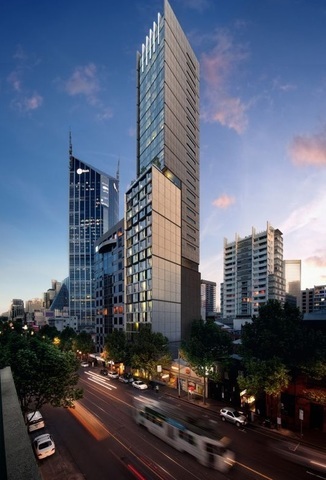 With notable projects and residential buildings being developed in the Central Business District (CBD) of Melbourne, the city has proved itself for an opportunity of investment and first time home owners. As a beacon of simplicity and sophistication, the Carlson captures the enthusiastic spirit of Melbourne. Designed by lauded architectural firm in Melbourne, ROTHELOWMAN, The Carlson is sculpted alongside with acoustic engineers to minimise the sound pollution that may come from the city trams and traffic. Like the city, it is modern and cultured; complex and intricate. Simplicity trumps excessiveness. Taking into account of the potential noise coming from the city, designers for The Carlson employed acoustic engineers to ensure effective noise reflection, allowing residents to unwind after a day of work or study. With refuse and recycling rooms in every level in the building, The Carlson aspires to be one of the front runners for environmental residences in Melbourne. Offered alongside to the unsurpassed architecture and design, will be a myriad of options on colour palates, finishes and contemporary furniture. did it just get taller? or is that my imagination? is it just me or? Something is looking pretty weird on the artistic impression - especially the top of the building where the building seemed to the growing larger and inclined at an angle? Which is the current design that was tendered for? I much prefer the fins ontop like Zen. 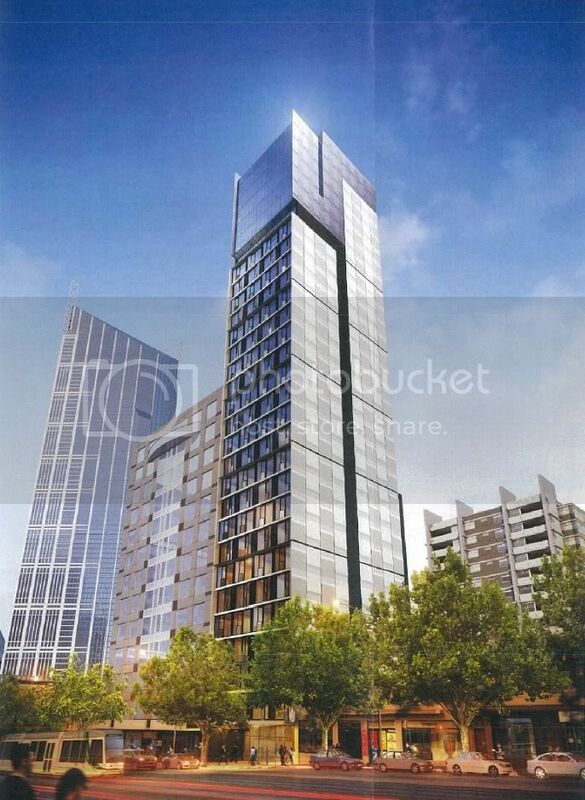 Also has there been any renders for the Southern side? separate buildings, carlson fits in the gap in pic above. why bother inserting west facing windows on carlson? How far from the mall and U. of Melboure? Yup, Hutchinson signage over the site, won't be long until demolition begins i'd say. Also, pretty sure I read somewhere that there's some sort of cafe or retail outlet that will activate the lane way behind.